I can't believe it's been a month since my last post! It would be an understatement to say I fell a little behind on my blogging duties! I'll have a lot of sketches, model sheets, and finished illustrations, though, that I will be posting both here and on my website come May. I'll also be adding a few new features on my webpage, including a section that will display some behind-the-scenes artwork that goes into each finished series of illustrations that I work on. To kick off the first Monday in March, I thought I'd post a little doodle that was inspired by the Tomie dePaola Award competition a few months back, in which those participating had to illustrate an excerpt from the Chicken Licken story. 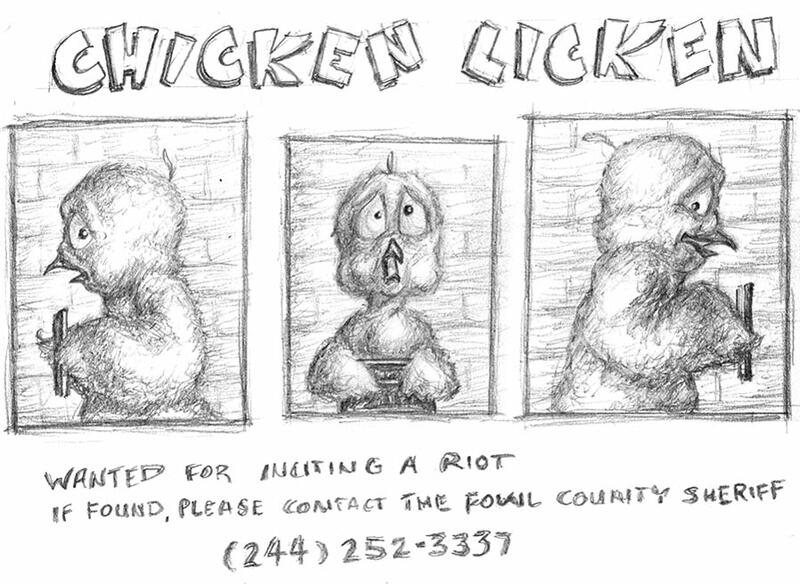 The Fowl County Police Department did not take Chicken Licken's actions very lightly! The poor animal is now a wanted criminal on the run!